Puerto Vallarta, Mexico (November 6, 2014) -The "Beyond All Inclusive, Beyond All Compare" Velas Resorts in Puerto Vallarta, Riviera Maya and Riviera Nayarit introduce creative custom cocktails for groups, now available at each of its four luxury properties in Mexico. Featuring local ingredients, these cocktails can be made to tie in with a special theme, from the selection of ingredients and name to the presentation. The service is an add-on option to the all-inclusive rate. Recently, Grand Velas Riviera Maya created the "Blue Island" cocktail for one group. 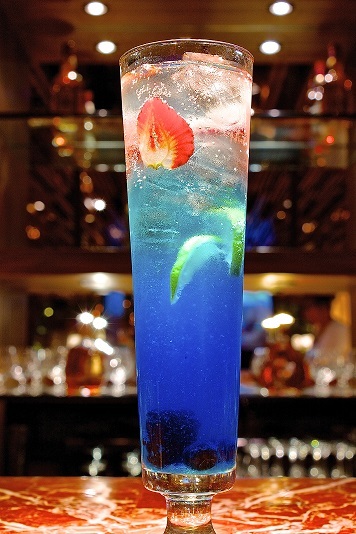 Featuring Citron Vodka and Blue Curacao, the cocktail was mixed with a lemonade consisting of simple syrup, lime juice and soda, then topped with fresh blueberry, lime and strawberry. Raising a glass to its meeting attendees, the Blue Island cocktail was served alongside world-class hospitality for the group. Offering unparalleled all-inclusive experiences for meetings and incentives, Velas Resorts offer spacious luxury accommodations, world-class spas, a la carte gourmet cuisine at a selection of specialty restaurants, and an indefinable hospitality experience. 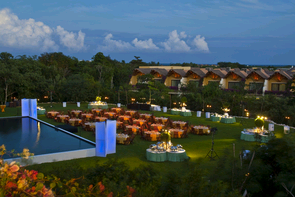 For more information about Velas Resorts and its group events, please call 1-866-847-4609 or visit www.velasresorts.com. Offering unparalleled all-inclusive experiences for meetings and incentives, the four Velas Resorts in Riviera Maya, Puerto Vallarta and Riviera Nayarit have earned more than 43 AAA Diamonds, including the prestigious Five Diamond Award. Other esteemed international awards for their services and facilities include Virtuoso's "Best Spa", Conde Nast Johansens' "Most Excellent Resort" and "Most Excellent Spa Hotel" and the American Academy of Hospitality Sciences' 5 Star Diamond Award. Properties include Casa Velas, a boutique adults-only hotel and ocean club located on the Marina Vallarta Golf Course, named the 8th Best Hotel in the World on The Expedia® 2013 Insiders' Select™ List, and Velas Vallarta, a family-friendly all suites resort and spa located on Banderas Bay, both in Puerto Vallarta; and the AAA Five Diamond Grand Velas Riviera Nayarit located on Mexico's famed Riviera Nayarit. Completing the group is Grand Velas Riviera Maya, located five minutes from Playa del Carmen, which offers the most sophisticated, ultra luxury all-inclusive resort experience in the Caribbean with jungle and beach settings. State of the art conference centers range up to 91,547 square feet of indoor and outdoor meetings and events space and offer an efficient and versatile canvas for creating scenic events and business gatherings from 10 to 3,000 guests. Outdoor gardens, terraces, protected beach area and gazebo space create beautiful backdrops for special events and meeting receptions, and five-star catering is ensured for any meeting or event and customized or pre-planned themed parties. Velas Resorts also feature spacious accommodations, spas, a unique culinary experience at a selection of restaurants, 24-hour insuite service, fitness centers, Butler service, extensive family programs, fully stocked mini bar and more. Velas Resorts are operated by Eduardo Vela Ruiz, majority owner, founder and president of Velas Resorts, with brother Juan Vela by his side, vice president of Velas Resorts.